If you love dogs, then you know all the benefits that come with keeping one at home: you will always have an excited fluff ball that you can play fetch with when you go home. Plus, when the pizza delivery arrives or you are expecting an Amazon package, your pet will alert you immediately through his bark, although he may get a little protective when the mailman comes around. Although it’s cozy to cuddle up with your pet, sometimes it’s not possible to share your couch with him, meaning your pet needs his own sleeping bed. This is where things get a little tough, especially if you are a pet parent who is very specific about what you want. There are loads of dog beds on the market to choose from, particularly if you are looking for a bolster bed. You can read a list of our general review on dog beds here. To find the right one for your pet, you have to rummage through quite a number to find the right one. Fortunately, we have done all the work for you and prepared a list of the best bolster dog beds for your pet. 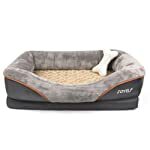 PetFusion is a high end, high quality memory foam dog bed with thick bolsters. It provides your pet with a surface to lie on and snooze comfortably all night. 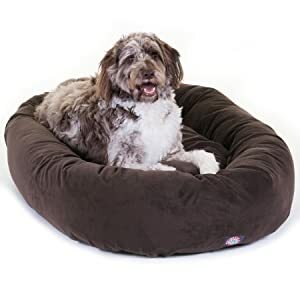 This dog bed is manufactured using 4 inches of memory foam covered with a water and scratch resistant cotton and polyester fabric blend. The filler material in the bolster is mainly recycled polyfill to provide your pet with plenty of support. Its cover can be taken off and machine-washed. If you want, you can purchase more covers to ensure your pet lies on a clean surface all the time. What’s more, there is an anti-skid surface at the bottom, which helps to keep your pet’s bed in place. The bed comes in a variety of sizes, with the most common sizes being small (24x20”), large (36x28”), Extra-large (44x34”) and XXL (50x40). If you are looking for a dog bed that provides all the comfort your pet needs, think about Majestic Pet. whether he needs a waterproof material or a little more spine support, this bed is an excellent fit. Its bagel shape enables your pet to lie in or sit comfortably. Within the bed there is a cushion and a bolster that gives your pet all the comfort he needs. The bolster provides your pet with spine support when he is sleeping. The bed’s cushion is made out of polyester providing your dog with a comfortable cocoon when sleeping or lounging. The bottom is waterproof and washing the bed is extremely easy. Unlike other beds where you have to strip off the sleeping material, this one can be placed into a washing machine and cleaned. Size is also not a problem. You can find it in four different sizes ranging from large to small. Thus, your pet can rest easy without having to sink or bend. Plus, it is a fitting bed for almost all breeds, including German shepherds and beagles. 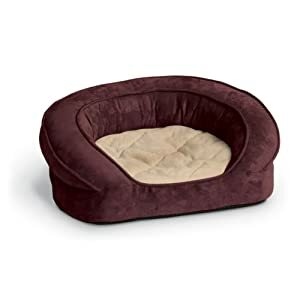 BarksBar Orthopedic is a mid-priced dog bed whose base is a 4” grooved and solid memory foam. It also comes with a beautiful cover made from an ultra-soft material with a quilted finish. The bolster has a cotton infill that is cozy enough to give support to your pet’s neck. The bottom also features a non-skid rubber surface to stop the bed from slipping or sliding when your pet decides to use it. As is common in almost every other dog bed, this one has a removable cover that you can clean using your washing machine. This bed is made in two sizes: Large (40x30”) and Medium (32x22”). This bed is also another mid-priced pet bed. Its bolster is curved providing a surface for your pet’s neck to rest his head when he is sleeping. The cover is resistant to water and scratching and you can remove it for cleaning when the need arises. The bottom is mostly rubber, which makes this bed non-slip and waterproof. It can withstand even the most messy kitchen floor. The best thing about this dog bed is its bolster. The manufacturer provided a generous amount of infill and a striking decorative finish on the bed’s edges giving it a beautiful look. In addition, your pet gets a squeaky toy as a free giveaway. You can find it in three different sizes: Large (38x28”), medium (32x22”) and small (27x20”). Manufactured by K&H crew, this dog bed is made out of velvet micro suede. The base is sturdy and consists of 3” of medical grade and quality orthopedic foam. If you are looking to treat your pet to a blissful ultra-plush relaxation foam, K&H is all he needs. If you own a senior pet, this dog bed makes a perfect choice. It features a well-stuffed bolster around the bed for a deluxe comfort. Its liner and cover can be removed and dry-cleaned. The bed comes in two different sizes: Large (40x33x9.5”) and Medium (30x25x9”). Dogs are loyal pets, whose love is unconditional. You get back from work after a hard day’s work and they receive you with a lot of joy. They are always ready for any kind of game, and as such they have become an important part of our homes. When your pet sleeps on a mat or the floor, he does his best to find comfort out of a hard surface. This is not ideal for your pet’s posture or spinal health. Sleeping on the floor comes with a lot of discomfort, and it can lead to an erratic sleep cycle. A restless pet usually ends up being irritable and difficult. In addition, sleeping less will cause your pet to develop poor health in the end. Sharing your bed with your dog isn’t a bad idea, but it can be uncomfortable at times. Dogs have a habit of turning and twitching when they are sleeping. The best thing to do in this case is getting him a pet bed so that there is enough space for everyone. Like us humans, dogs enjoy sleeping in a warm environment. When your pet sleeps on the floor during summer or winter, he is exposed to extreme temperature changes. This can cause health problems especially because dogs are affected by inconsistencies in ambient temperature. Thus, you should get him a bed so that he can stay warm even on a chilly night. Your beloved dog shouldn’t have just any bed. Before you spend big bucks on a dog bed, there are a few things you need to consider. Size matters when it comes to a dog bed. No pet parent wants his or her pet to feel like he sleeps on a bed that is one size too small. Ensure you know your pet’s dimensions before you choose a dog bed. If your pet tends to wet his bed or loves to roll in mud, ensure you buy a dog bed that you can clean easily. 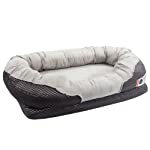 You will want to look for a dog bed that is both machine-washable and waterproof, so that it will be easy to keep his sleeping areas clean and dry. Getting a dog bed with a machine washable cover is a good way to make this cleaning duty easy for you and your dog. It is important to consider value as you wouldn’t want to buy a dog bed that is expensive or cheap but doesn’t meet your pet’s needs. There are beds with other important features like a breathable material, an anti-slip fabric or memory foam. 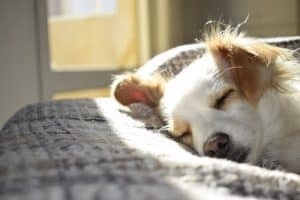 As much as you would like to find the best pet bed for your dog, it is equally important to ensure you can keep his sleeping areas clean without causing undue harm. Some cleaning agents can cause harm to your pet, so try to find a dog bed that you can clean without having to use cleaning aids. If your pet enjoys the comfort provided by bolstered beds, he will definitely love the PetFusion Ultimate Dog Lounge. Most pet parents love its impressive design and quality of finish. It is warm thanks to its thick bolster that offers your pet all the comfort he deserves. Plus, you can take off the cover and stuff it into your dry cleaner for a thorough wash.